NPR Books recently launched a new feature called TIME MACHINE, to encourage more thorough coverage of series, since mostly there are a lot of reviews of first and last books, but not a great deal of critical attention given to a series as a whole, or to its middle books. 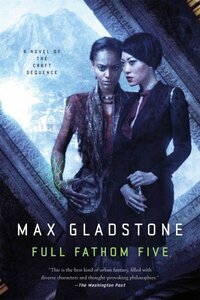 I opted to cover Max Gladstone’s Craft Sequence, and my review went up this past weekend. 750 words contain only a fraction of what I could say about this series. I didn’t touch on the beautiful economy of its prose, the ways in which the world-building is devastatingly clever, the conflation of soulstuff and capital and the implications of that — but hopefully it’s enough to be getting on with, to convince you to pick up the books and talk to me about them, because they’re just SO GOOD and Elayne Kevarian is my everything and I can’t wait to see more of her in Last First Snow. I also didn’t get to mention that Gladstone’s written a text-based game called Choice of the Deathless. It’s a great introduction to the concepts and locales of the series, and I’ve played it through an embarrassing number of times. It’s whiled away many a long commute. There’s also … A scene. About grammar. That is the best scene about grammar in the history of everything. This entry was posted in Uncategorized and tagged max gladstone, novel, npr, review. Bookmark the permalink. This looks good! May I reblog? This looks good! Have you read this series?